A web platform that anticipates future growth | Clarity Innovations, Inc. 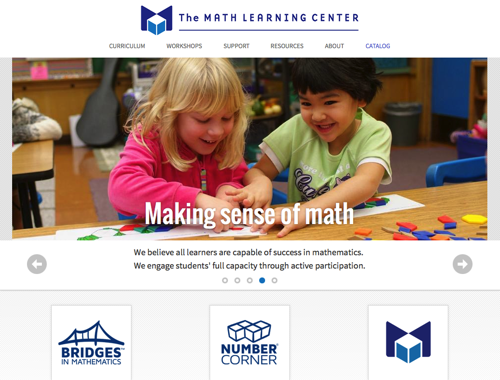 The Math Learning Center approached us with the challenge of preserving the design of their website while implementing a content management system that could accommodate enhancements and new functionality. Now, after engaging with Clarity, Math Learning Center has a site that grows as the needs of their organization grows. 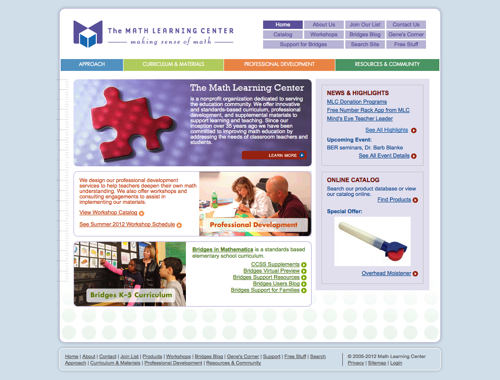 Math Learning Center provides extensive information about their curriculum, workshops, and product offerings through their Web site. Though they were satisfied with the look and feel of their website, the organization struggled with its cumbersome content management system and overall inflexibility. These drawbacks were impeding their workflow and future plans for development of their online presence. We engineered the Math Learning Center’s Web platform based on Drupal and migrated their existing content to the new site. We emulated their previous look and feel by adapting existing template themes and creating new layouts as necessary. With Drupal’s extensibility, we were able to build new, custom features such as an integrated system for highlighting special product offers. Training and deployment of the website into production were also included. The new website launched in early 2013, introducing a modern look and feel and significantly “flatter” structure for better ease of use and maximized SEO. Math Learning Center also successfully initiated a social media program including Twitter, Pinterest, and YouTube. Now, Math Learning Center staff and associates can edit and add content directly within the context of their site. They can even change its organization and navigation as desired. And, most importantly, they can more easily entertain the growth of their site as the needs of their organization grow.